But, everyone has chores. And let’s face it, when you get home 3 or sometimes 4 hours before your significant other you’re just going to have more of the chores to do. And there are certain tasks I dislike but do a better job of (like ironing and sorting mail, I hate dealing with the mail), so I let them snowball until they become so giant they cannot be avoided for one more minute. And then I dedicate hours or even days to getting them back on track, which puts me behind with everything else I need to do that week, and it just keeps repeating the cycle. Once I’ve gotten to the bottom of The Dreaded Task, I cannot bear to look at it again for a while. Which, of course, leads to another marathon session of Dealing With It. So anyway, I started looking around on Pinterest in January for ideas and strategies to help get me focused and juggle the small stuff so I could free up time to focus on the things I actually get excited about: more playtime with the baby, my hobbies, fun work projects. I stumbled across this whole subculture of (largely) Christian, homeschooling, stay-at-homes who run their households with military precision. A system for everything, a clean and tidy home, and an arsenal of creative activities with their kids. I even found a Salon article about this after I started my research. It’s a thing. Now, I happen to be the exact opposite of a Christian, homeschooling, stay-at-home mom, so obviously not everything was going to work for me. But I just needed some direction, and that’s how I found Clean Mama. I can’t say I’ve become a regular reader; the level of devotion to cleaning and organizing is more than I can handle every day. 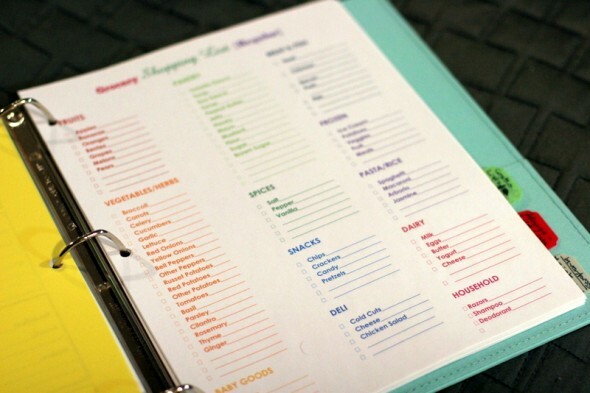 But, her post “How To Make a Homekeeping Binder” spoke to the list lover in me. She has some great printables and kits on Etsy to use, and I did buy a couple for organizing holidays and my blog. For the rest, I took some inspiration and created my own templates personalized to suit my family’s needs. There is nothing more motivating and focusing for me than being able to cross an item off a list, so she kind of had me at “hello.” I also made one for work and another one for my blogging and crafty life, but the latter hasn’t had much action yet. One thing at a time. It’s been a full month of using this new system, and while I’m still getting used to the routine and still have setbacks and things I avoid, I have to say it’s making the day-to-day of life much more manageable. I made a monthly calendar of To Dos for my home and work binders, just like in Clean Mama’s binder. But I didn’t use her template because a lot of it was irrelevant to me. 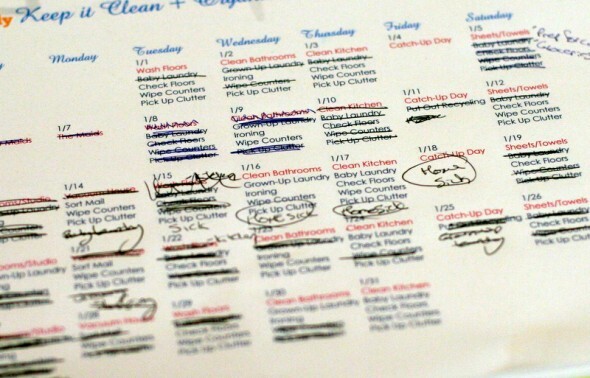 I designed a similar looking calendar with my own household needs. For each day of the week I’ve designated One Main Task in red. 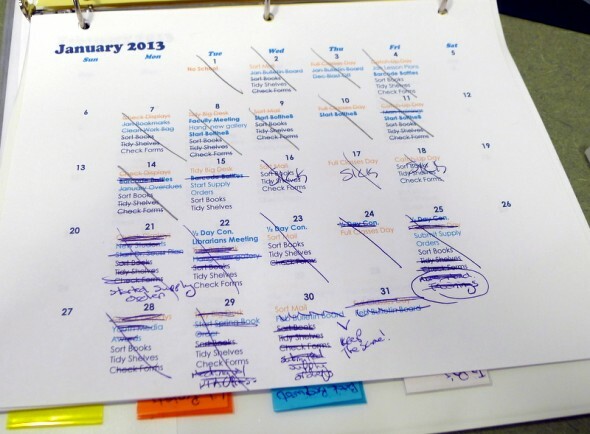 The blue tasks repeat more frequently, some every day or every other day. 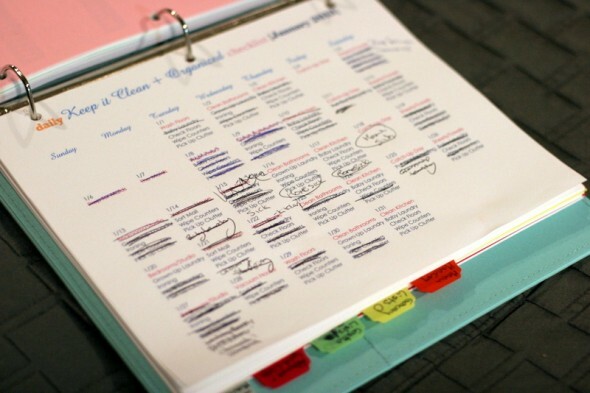 This helps me just have a set schedule for doing laundry, sorting the mail, and etc. I’ve also noted the once-a-month visit from our cleaning service and the prep day for that. My work binder has the exact same principal, but a little more detailed. Big weekly tasks are in orange, everyday tasks in dark blue. But for work I’ve added light blue tasks that include meetings, self-imposed deadlines for things like changing bulletin boards and submitting orders. All of this is to try and give me a routine for running the library so I can easily keep up with the daily management of it all in addition to my class load. This work calendar has been kind of a lifesaver. I also included sections for work projects and a running list of book requests so I can easily log books I need to order. 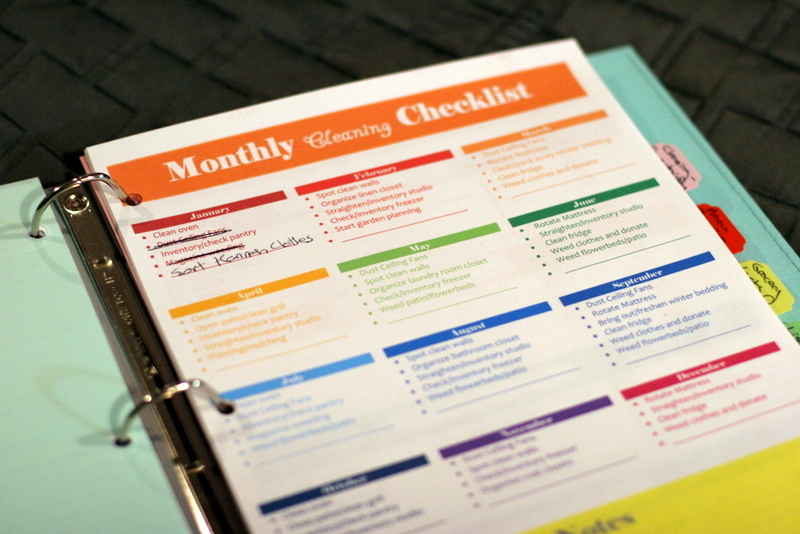 For my home system, I didn’t want to assign days to complete certain monthly tasks, so I also made this checklist. Most of these repeat every other month or so, but this is to try and help me stay on top of the less frequent chores that I can forget about indefinitely. I still haven’t cleaned the oven, though. I’m still growing into this. This is where I got extra nerdy. I made customized shopping lists for regular groceries and for Costco. The latter is so Adam and I can stop looking at each other on weekends and asking, “Do we need anything from Costco?” The former is just to have a list of things we actually buy. 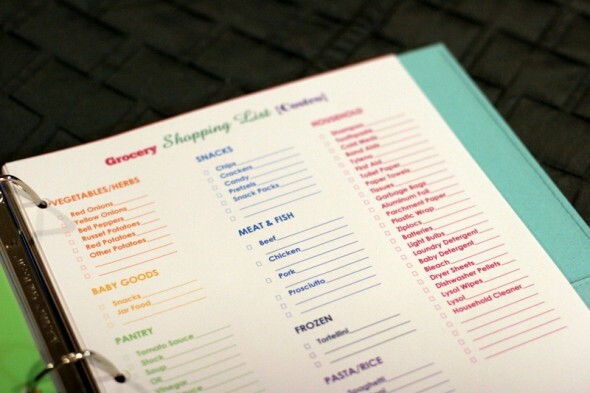 I’ve been using these great shopping list pads for years, but they’re missing some of the everyday things we buy and are full of stuff we never use. So I thought customized would be better. I even made customized menu pages so I can keep it all in one place. So far I like this system, and I am using it. And it’s nice to be able to point Adam to a list of things to be done that day so he can help. I am not yet at the magical point where I’ve gotten time back for the rest of my life, but it’s been a tiring winter. I wasn’t expecting to achieve this goal in a month, but I am moving along with it.